Today, I would like to share a super easy DIY project. I’m going to show you how to recover a dining room chair or any chair with a simple upholstered seat. For minimal costs, you can change the entire look of your dining room, breakfast area, desk chair, or accent chair. I have a Queen Anne Chair that I have recovered several times depending on where it was placed in the house. As I was decorating my upstairs bonus room, I decided I had just the spot for that chair. I just needed to recover it. The supplies needed for this project are a fabric of your choosing, scissors, tape measure, needle nose pliers, screwdriver, and a staple gun. First, turn the chair over and locate where the upholstered seat is attached. On my chair, it was attached at each of the four corners. Second, using your screwdriver loosen the screws and remove them. Remember to place them in a safe place, because you will need them when you put the chair back together. With a pair of needle nose pliers, remove all the staples or fasteners from the upholstered seat. Remove the old fabric. You will next need to measure your fabric. A tape measure comes in handy for doing this. I like to use the old fabric as a pattern. I simply place it on top of the new fabric and cut to size. Now, it is time to position the fabric onto the seat of the chair. Make sure you have your pattern placed just the way you want it. Pull the bottom edge over the top tightly and staple. Continue these steps on the opposite side. Then, it is time for the corners. Fold each corner and secure with your staple gun. When all the fabric is secured in place, position the upholstered seat back upon the chair. Take the screws that you put in a safe place, and attach the seat onto the chair. Below is where the chair is sitting in the bonus room. I recovered my dining room chairs a few years ago. These chairs have been changed a few times. However, it is an inexpensive way to change the look of a room. Thanks so much for stopping by. If you have any question regarding this project, please contact me. I know that I’m not always the best at giving instructions. I hope that you have a wonderful Wednesday, and please stop back by tomorrow for Tablescape Thursday. Isn’t it amazing what a difference a little fabric makes? Your chair looks great with the new look in its new home. Thank you so much Eilis! It is amazing what a little fabric will do. My parents live close to an outlet that sells high end fabrics for a very good price. A lot of them are remnants of anywhere from 2 to 4 yards, but I always come back with a stack. I have a cabinet devoted to my fabric collection, and it is getting full-lol! I’m so happy that you stopped by, and I hope that you have a wonderful day!!! We must be “related” by your comment about the fabric stash..:) I have one too and it has saved me many times from a sudden expense either for a project for myself or a gift. Thank you so much for the post and the clear instructions. God bless! Hi Karen! I love your comment about us being related because of our fabric stash. I think I’m getting just as bad about collecting fabrics as I am about collecting dishes! It works out great though when I want to do a small project like changing out my pillows. I’m so happy that you stopped by, and thank you so much for your sweet comments. I hope that you have a wonderful day!!! I love how using paint or fabric it can change the look of a room so quickly. Recovering your chair gave the room a brand new look. Sometimes that is all it takes to make you fall in love with your room again. Hi Debra! I so agree with you about paint and fabric giving the room a brand new look. This is something that you can do at very little cost. I’m so happy that you stopped by, and I hope that you have blessed day and a wonderful weekend!!! Shannon, I love your decorating!! Changing out the seat covers is so easy and makes such an impact. Love the new fabric you chose. Hi Stacey! Thanks for the very sweet comments. I love your decorating too! I subscribed to your blog several weeks ago and enjoy reading it. Thanks so much for hosting the party! I hope that you have a wonderful week!!! Beautiful chair – and the fabric gives it a whole new look. I just did a chair makeover, as well! Ann, thank you so much for the very sweet comment! I’m so happy that you stopped by, and I hope that you have a wonderful week!!! I love how easy it is to change out seat covers for a whole new look! Hi Deanna! It is amazing what a little fabric will do! I’m so happy that you stopped by, and I hope that you have a very Happy Monday!!! Changing the fabric on chairs totally makes a new look. I also love pillow covers. Inexpensive way to update a room. Your chair looks awesome. Hi Carol! That is a very good point about the pillow covers. Plus, it is does not take up as much space to store them, and you can switch them up according to the season. I’m so happy that you stopped by, and thank you so much for your very sweet comment! I hope that you have a wonderful day!!! Great job! That chair would look wonderful in my home as I have red toile and check in my kitchen and dining room. Thanks for sharing. Thank you Sandi, and it does sound like that chair would look great in your home too! Clicked on your link shared in Metamorphosis Monday @ BNOTP and Oh My! What a pleasant surprise to see a home with Traditional styling. I admit I am drawn to the neutral and gray rooms so popular, however, I cannot bring myself to paint or replace my traditional pieces and rich colors. I wonder if the mahogany, oaks, cherry and walnut woods will return in home furnishings? The blue inspired pieces, dishes & lamps are a favorite too. OMG this could be my home! Hi Gerri! I’m so happy that you stopped by. This room tends to have more color in it because I wanted a warm and cozy place for our family to hang out in. I decorate in true French Country Style which has more wood tones and colors of the French Countryside. It just fits my style. I also think that when you decorate in a traditional style that it is timeless whereas trends come and go. You can always add a trendy accessory or pillow, but I feel that your main pieces should be timeless ones. They are the ones that you invest the most money in, and more than likely they are the ones that you will have the longest. Thank you so much Lorraine! I’m so happy that you stopped by, and I hope that you have a wonderful afternoon!!! Great job! My kitchen chairs are in desperate need of a makeover and you made this look very easy. Sandra, it is so easy to do! I have recovered my dining chairs three times. It is such an inexpensive way to change the look of a room. Thanks so much for stopping by, and I hope that you are having a wonderful week! Love the new fabric…great job! Thank you Shirley! It’s amazing what a little fabric will do! Hi Shannon, I am fairly new to hometalk. Just stumbled onto your site tonight. So far, yours is the most beautiful home that I have seen. I just love what you have done, I am not very good at decorating, All I know is that I love the French Country and the Country Chic look. You are so very talented and I am so glad I found your posts. I think I have read everything you’ve posted tonight. Please, keep them coming. Hi Marsha! Your very sweet and kind comments have made my day! I’m so flattered that you enjoy reading my blog. 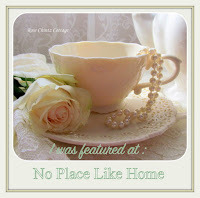 I’m new to both blogging and Hometalk. I have been blogging for around two months, but I’m so excited to be starting this new adventure. Gracious comments like yours make it worth while! I’m so happy that you found my blog, and I hope that you have a wonderful and blessed Sunday!! !